It’s safe to say that the Volkswagen Arena has not been a fortress for Die Wölfe this season . Quite the contrary. Heading into this game, Wolfsburg were winless at home in the Bundesliga and had provided their supporters with just two goals in their six home games. A visit from high flying, Hertha Berlin wasn’t going to be an easy task for Valérien Ismaël’s men but could Wolfsburg finally put their awful home record to bed on matchday 13? The Hertha fans had packed out the away end and were creating an almighty racket and they were presented with the first real piece of action from their side. Valetin Stocker’s long ranged effort forced a strong save from his fellow Swiss international, Diego Benaglio. Watching the capital club live, I could see the reason behind their recent success. Their quick, slick passing was already threatening to tear up the home side’s fragile defence. However, it was Wolfsburg who scored the opening goal in the 12th minute. Yannick Gerhardt’s skilful run down the left was then followed by a delectable cross that found, Daniel Caligiuri. His header at goal was pushed away by Berlin goalkeeper, Rune Jarstein but Borja Mayoral, on loan from Real Madrid, pounced on the loose ball and had the empty Hertha goal at his mercy. 1-0 to the green and whites. However, their lead was short lived. In the 16th minute, Marvin Plattenhardt’s exquisite free kick left Benaglio rooted to the spot as the ball flew into the Wolfsburg goal. The home side seemed to want to make up for the catastrophically abysmal football they’ve been playing this season as two minutes later they were back in front again. The accomplished, young midfielder Gerhardt in the thick of the action again. The man who’s represented Germany at every level playing a perfectly weighted lofted ball over the opposition defence to find, Paul Seguin. His first touch was a touch of genius and to round it off, he went on to put the ball in the back of the net with a well-taken finish. An action packed first eighteen minutes but the remaining twenty-seven minutes handed over very little action. The second didn’t spark into life immediately. Wolfsburg were proving marginally better from the side that has returned no wins for its fans at home this season but a third goal looked unlikely. Hertha Berlin proceeded to get more and more dangerous as the match went on, with their fans continuing to provide an electric atmosphere inside what is normally a rather quiet stadium by Bundesliga standards. In the 59th minute on came Vladimir Darida and Alexander Esswein. The 26-year-old, Esswein needed just ten minutes to make an impact. After letting the ball run across his body, he hit a low driven shot from outside the area that found the bottom corner. A fairy-tale return for the former Wolfsburg man. Paul Seguin was to be sent off in the 87th minute. A tug on the shirt of, Salomon Kalou left the referee with no option but to hand out a second yellow card for the 21 year old, who was treated to a slightly happier response by the VFL fans as they applauded him off the field. Following his dismissal, the home side were content to settle for a point. But a draw they would not get. In the closing minutes of the game, Plattenhardt beat Caligiuri to the ball on the left side of the penalty area, resulting in a clumsy tackle from the 28-year-old. Referee, Dr Jochen Drees pointed to the spot and awarded the away side a penalty. Salomon Kalou stepped up and sent Benaglio in the wrong direction. The Hertha team celebrating in front of their noisy fans as many Wolfsburg fans left their seats and headed for the exit. They’ve seen this happen too much this season. A more entertaining loss which can be seen as a positive, but a loss all the same. 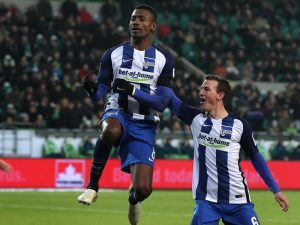 Hertha BSC triumphed in the second half and continue their impressive campaign while VFL Wolfsburg could potentially slip into the relegation play-off position if Darmstadt should beat Hamburger SV in Sunday’s 15:30 clash. Troubled times indeed.